Elegant Hanging Advent Wreath, made of solid brass in two-tone finish. 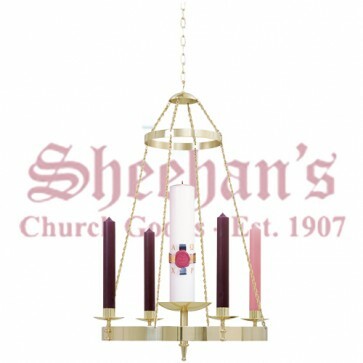 This attractive church advent wreath measures height 36", width 25", 4 ft., of 1 ½" link chain is included. Usually three of the candles are violet-colored, and one is rose-colored. Increasingly, due to changes in the Church's lectionary in the United States, all four candles may be violet. When used in household devotion, one violet candle is lit on the first evening of Advent (a Saturday). On successive Saturdays, the second violet candle is added, then the rose candle, and finally, the third violet candle. Some Anglicans and Lutherans use blue candles rather than violet. Some wreaths have a larger, central fifth candle (generally white), which is lit on Christmas Day to signify Christ's birth.